This means that players may pass through all 21 Cities on the Game Board and even eliminate Raging Titans while in them. Note that when a Titan is eliminated, players may not place Bard tokens in an unavailable region but they are allowed to build Sorcerers' Guild Stories in Cities bordering unavailable Regions. For a three-player game, use the 18 City tiles with the symbol. Place only four Units on Recruitment tiles, rather than the five used in a four- or five-player game. Only four Recruitment tiles and four Threat tiles are placed on the Game Board (instead of five). The three Assessment tiles are placed with the side visible. The Dummy Player does not take part in Military Census events and does not move around the Game Board. Set up the Dummy Player Board next to the Game Board. Place a Dummy Player token on space 6 on the Dummy Player board, in the column containing the symbol corresponding to the first Assessment tile; place a second token on space 5, in the column containing the symbol corresponding to the second Assessment tile; and place a final token on space 4, in the column containing the symbol corresponding to the third Assessment tile. Note: For a more challenging game, you can configure the Dummy Player with 7 points for the first assessment, 6 for the second and 5 for the third. The rest of the game setup is essentially the same as for a four- or five-player game. 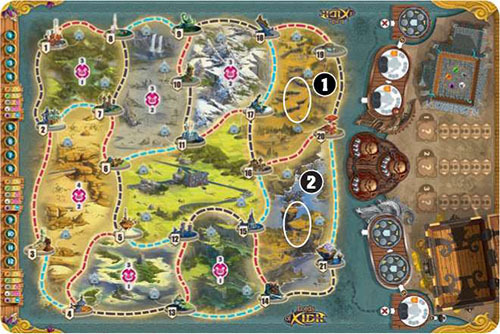 At the start of the game, the dummy player already has a certain level of Influence with the magical community, a level of Wealth and a level of Reputation across the Kingdom. These levels are indicated by the three Dummy Player tokens on the Dummy Player Board. 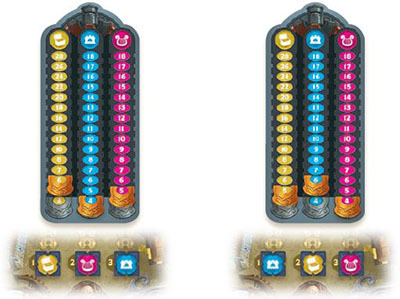 During the game, whenever a player eliminates a threat, they must move one of the Dummy Player tokens up one space on the Dummy Player Board, increasing its Influence, Wealth or Reputation accordingly. Stephanie has eliminated a threat and decides to increase the dummy player's Wealth. The winner is designated by the same process of elimination as in a four-player game. The points accumulated by the Dummy Player are taken into consideration. It is therefore possible for the dummy player to eliminate human players. If the Dummy Player ties with a human player on any of the assessments, the Dummy Player is eliminated. Place the Calendar tiles on the Calendar space on the Game Board, to restrict the game length to nine Game Years. Military Censuses are performed at the end of the third, sixth and ninth Game Years. With five players, remove City tiles nos. 20 and 21 and place an Empty token in Region 2. With four players, remove City tiles nos. 19, 20 and 21 and place an Empty token on Regions 1 and 2. With three players, remove City tiles nos. 14 and 18 (remember to use the set of tiles with the symbol) and place Empty tokens on Regions 1 and 2. The rest of the game is played in the same way as the standard version.